A Birmingham band who fuse 1920s and 30s jazz with modern dance beats, circus skills and burlesque dancing are getting toes tapping across the UK – just six months after their launch. All this has been achieved before the official release of the first single. And what makes their success more remarkable is that there is no TV show, record label or music Svengali behind them . Instead, the performers – with the help of Co-operative Futures, which helps co-operative businesses to start and grow – have formed a worker co-operative, meaning equal pay and an equal say for everyone involved in the creative process. 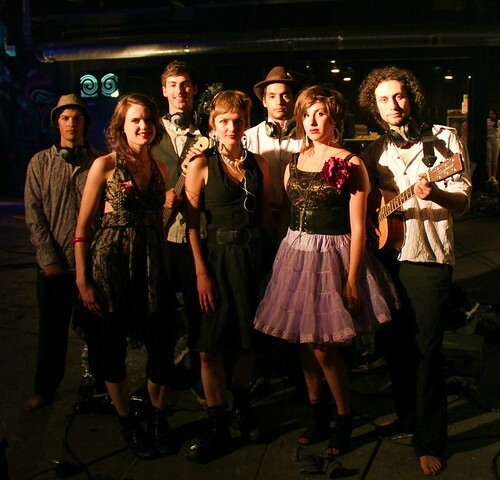 Electric Swing Circus was formed by Tom Hyland, Ellie Williams and Chandra Savale Walker – who wanted to form a band that mixed music and theatrical performance. The collective now includes a dancer, circus performer, sound engineer, lighting technician and choreographer as well as musicians and vocalists. The band’s baptism of fire started at The Book Club in London, where they played to a crowd of 400 people. A concert at 1,000 capacity The George in Islington and the closing festival of Liverpool Sound Week followed. And on November 11 the band played their first ever headline show to an enthusiastic local crowd at the Hare & Hounds in King’s Heath. 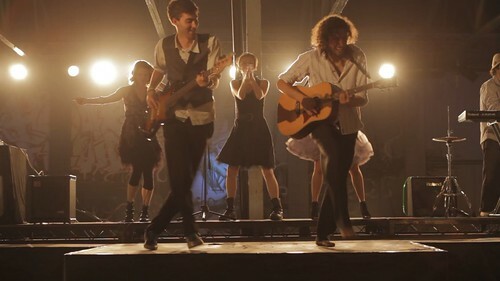 Meanwhile the Realm Pictures-produced video for their self-penned debut single The Penniless Optimist – which was filmed at Boxxed in Birmingham – was picked up by the BBC to be played at 20 Big Screens around the country, including the one at Birmingham’s Big Screen in Victoria Square. On You Tube, meanwhile, the video has been watched over 7,000 times, while DJ Craig Charles has played a remix of the track on his Radio 6 Funk and Soul Show. Electric Swing Circus are one of just a handful of electro swing bands in the UK. The genre, which combines the music of old jazz legends like Cab Calloway and Fats Waller with a contemporary backbone of bass and drums is more frequently played by DJs, sometimes accompanied by a vocalist. “Electric Swing is on the way up,” explains Tom. “It’s great party music and ideal for festivals. It’s completely accessible but not at all cheesy – it still has a lot of grit.” Bass guitarist Pat Wreford describes it as ‘old music with a new twist’. The lyrics are penned by Ellie, who has a background in theatre and is inspired by the Andrews Sisters and the tradition of three-part harmonies. Ellie is joined on vocals by Julia Higgins, who joined the band as a hula hoop performer before grabbing a microphone as a backing singer, and Laura Louise. All of the members are committed to the co-operative roots of the project. Tom says: “I saw how things worked in other bands – one person with a vision maintaining creative control. We didn’t want to be like that – which got us thinking whether a co-operative structure would be a better way. While accomplished musicians and entertainers, the band needed assistance with the legal and procedural aspects of forming their co-operative. Luckily Co-operative Futures were there to lend a helping hand. For more information on starting a business that is a co-operative, log on to www.futures.coop, email info@futures.coop or call Jane on 08454 562506. To find out more about Electric Swing Circus log on to www.electricswingcircus.com. The band will be playing at 78 Bar in Birmingham on December 10, Ort Cafe, Birmingham on December 16 and The Secret Garden Pub in Battersea on December 17.